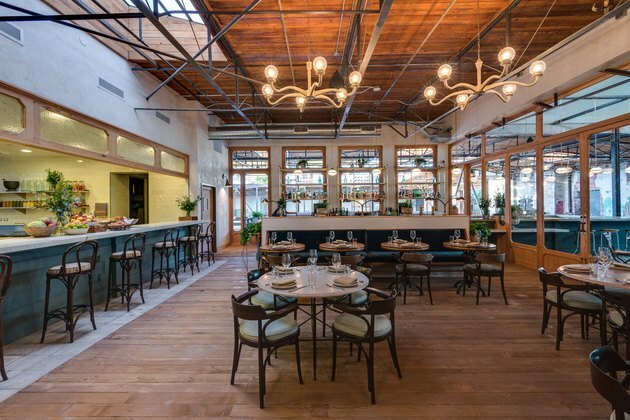 The co-presidents of the Hauser Wirth & Schimmel arts complex in downtown Los Angeles had a two-fold goal for opening their first restaurant in the United States. They wanted a Texan menu, and they wanted to serve it — and this is the important part — in a space worthy of its inventive neighborhood. Set in the burgeoning Arts District, where an influx of creativity has centralized in recent years, the duo agreed that the complex needed a gathering place for local artists that looked like a reflection of their craft. 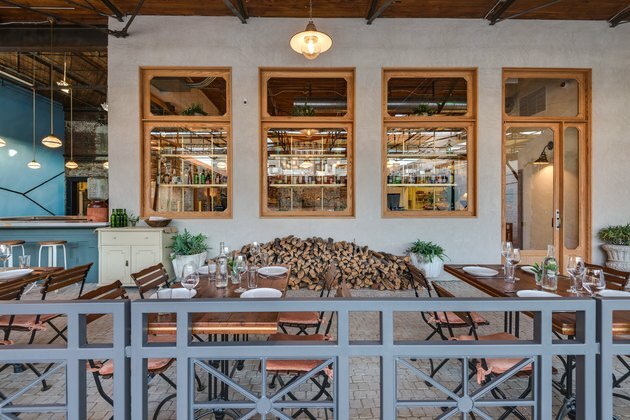 So, they worked with architect Evan Raabe of Creative Space and designer Matt Winter of M. Winter Design to create Manuela, an eatery that's artistic in every detail. Winter was particularly inspired by the past, and used styles from the mid-20th century to inform everything from light fixtures to bar stools. Furthermore, the team used many original building elements in the decor, including glass from the structure's roof lights. The result is a design that is an innovative homage to the past, and clever hub for the future. The restaurant's walls feature works by many contemporary artists, including this painting of a L.A. map by Mark Bradford. For the brass and marble bar, Winter was very intentional about the hand-carved seats. "I wanted a 1930s 'art studio' stool to go with the vibe of Hauser Wirth & Schimmel," he said. The bar serves as the complex's "living room," and has a menu of classic cocktails made with house-made bitters and tonics. A kitchen garden provides the restaurant with seasonal produce — which also makes for great decor. 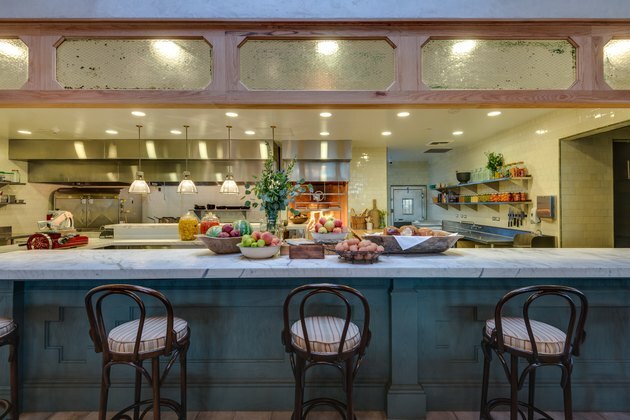 The bar stools at this chef's table are a set of original Thonet bentwood chairs, and Winter outfitted them with custom cushions featuring 1950s deadstock fabric. 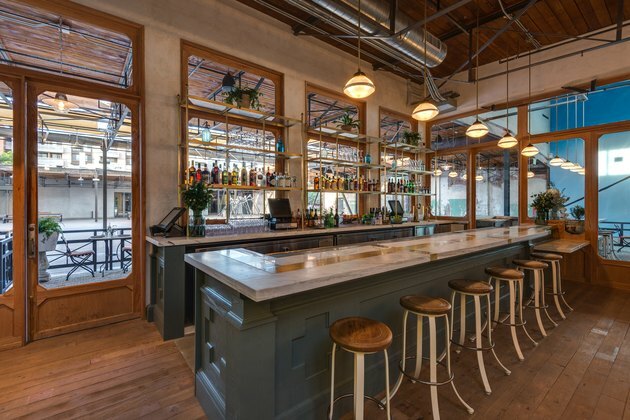 Winter put 1930s Mercury glass shades over custom fixtures that provide ambience against the weathered brick. 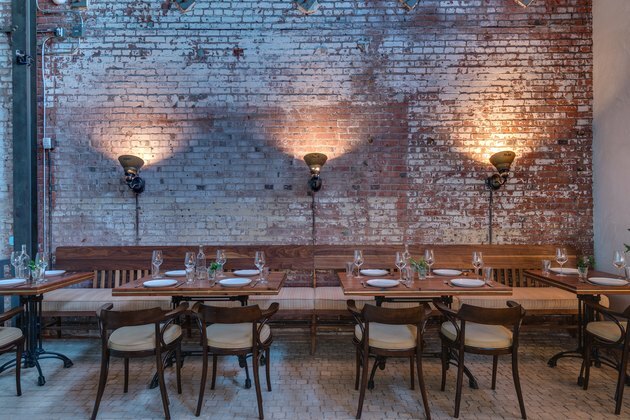 The tables are made out of wood from the building's original fire doors, and have brass strips that run along the edges. Many of the private dining room's design pieces were reclaimed or reconditioned from vintage finds. Winter made the pendant lights from 1930s Prague street lamps, and reconditioned the pink court chairs that were once used in Downtown L.A. during the 1940s. The window glass is also from the building's original roof lights. 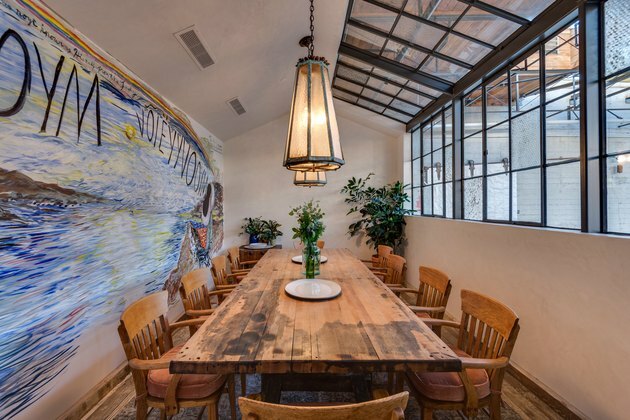 Artist Raymond Pettibon was specially commissioned to create the mural in the private dining room, and the blues in the Alpine scene pop against the wood table. The metal and wood in the outdoor patio tables also came from the building's original fire doors. Winter got the idea for the matching chairs while traveling in France and seeing a similar version from the 1900s. 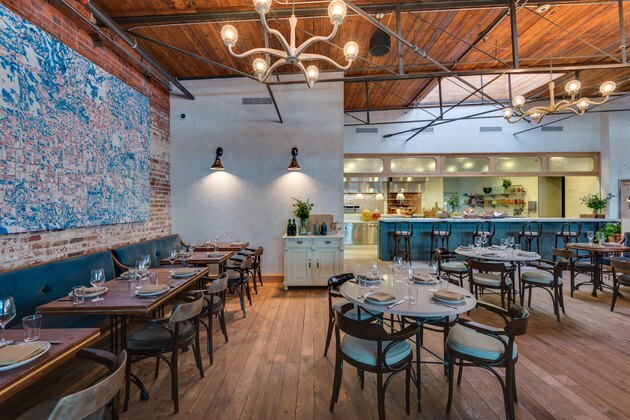 The restaurant looks and feels like it's been around for decades — antique materials mixed in with Winter's bespoke furnishings make the space feel warm and comfortable, and the modern art pushes it all to a new level. Manuela is truly the best of the food, art and design worlds.